Stand Up Paddleboarding for Skiers?! At Family Ski Trips we are always craving winter. But summer doesn’t have to be a bummer. We find our adrenaline fixes when alpine skiing is on summer hiatus on the water and in the mountains. Biking and hiking don’t quite emulate the thrill of schussing downhill. Water skiing does but you need a boat, ski, towline, driver, spotter, fuel and flat water! 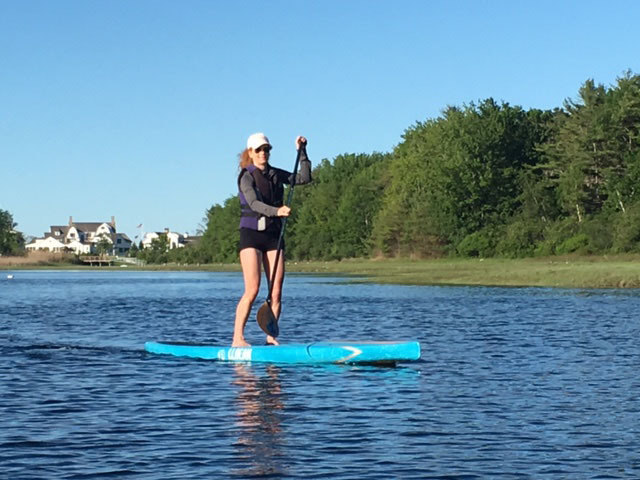 Stand Up Paddleboarding on the Maine Coast, we discovered and found “SUP” to be fun, and pretty simple as a skier. It’s refreshing too if you fall in the freezing salt waters of the Atlantic. The best part of paddle boarding is the core workout for your ski physique. Your abs are engaged as you paddle and your leg muscles are firing as you balance on the wide board. And much like skiing and snowboarding, you are distracted from the “exercise” because you’re focused on the scenery, the water and riding the surf. You can ride the board in the waves or just paddle yourself around a bay, lake or pond. Learn from an experienced paddle boarder, or take a brief lesson. The sport is not that complicated if you have good balance (as most skiers do) but a few pointers get you paddling like a pro in no time. My strokes were far more efficient once my friend told me to flip my paddle over – rookie movie. Wear your safety leash so you don’t lose your board if (when) you fall off. Much like your ski gear, it is your responsibility to carry and control your board – on land and in water. Have a PDF, life jacket, with you, its the law and its just plain smart. Start small and work your way up with SUP. Begin on gentle calm water out of the way from any busy boating channels and strong currents. Once you have strong balance and paddling skills to maneuver and turn your board, you can try riding the waves in open water or beach surf. Know Navigational Laws, “right of way,” tides and currents, and stay out of the way of other vessels. Consult local Coast Guard or Marine Patrol if you are not familiar with the rules of the waterways. I have seen some close calls and near collisions between clueless paddle boarders and commercial Maine fishing boats. Boats doesn’t have brakes. Don’t forget the sunscreen, the sun’s refraction is intense on the water. Enjoy your summer SUP! Ski season will be here soon enough; your abs, quads and gluteus will be prime from paddling. Like the Skiers’ Responsibility Code, the US Coast Guard has 10 tips for Stand Up Paddleboard safety. 10. Take a safety course.